A freedom of information tribunal is being urged by environmental campaigners to reject Government attempts to keep secret sections of ministerial briefing papers on air pollution in London. The Government’s appeal against a previous ruling to make the information public will be heard today and tomorrow (12 and 13 January 2011). The information could have major implications for Government efforts to prevent the European Union prosecuting the UK for persistently breaching air quality laws. It has been requested by Simon Birkett, who is Founder and Director of Clean Air in London and represented by lawyers from Friends of the Earth’s Rights and Justice Centre and barristers Gerry Facenna and Laura Elizabeth John of Monckton Chambers. A separate decision from the EU on its legal action is expected imminently. In January 2009 Clean Air in London filed a freedom of information request asking for “a copy of any minutes, papers, correspondence or other material relating directly to any meeting (including sent subsequent to it) that takes places between Lord Hunt [Environment Minister under the previous Labour Government] and Mayor Johnson”. The sections of the documents which the Government has yet to release are believed to relate to the western extension of the congestion charging zone and air quality. Despite two rulings in favour of Mr Birkett (by the Information Commissioner’s Office in November 2009 and at an appeal heard by the First-tier Tribunal in May 2010), the Government has continued to refuse to make the information public. The Government is appealing for a second time (this time to the Administrative Appeals Chamber of the Upper Tribunal) – arguing that it was entitled to say, for the first time to the First Tier Tribunal, that the information is covered by ‘legal advice privilege and litigation privilege’. “For two years successive Governments have fought to keep information about London’s air quality secret – if only they’d put as much effort into meeting pollution laws. “The Mayor estimates that the early death of some 4,300 Londoners in 2008 was attributable to long-term exposure to dangerous airborne particles – mainly caused by diesel-powered vehicles. This is a national disgrace. “The Government’s approach to this case makes a mockery of information laws. “When the Information Commissioner’s Office ruled that the Government’s reason for refusing to make the information public wasn’t valid, it came up with two completely new reasons for keeping these documents secret. Defra’s appeal follows a decision by the First-tier Tribunal (Information Rights) (FTT) in May 2010 to reject the Government’s attempt to raise new legal arguments late in the original appeal process. The Government admitted there were no special reasons why the FTT should consider the arguments and that the only reason it had not made them earlier was an error. The FTT ruled within minutes that the Government was not allowed to introduce new arguments. As a result, the Government’s barrister stated in open court that “it does not have much of an appeal left” if it could not claim belatedly ‘legal professional privilege’ (or ‘legal advice privilege and litigation privilege’). The FTT hearing related to an appeal by Defra against an Order by the Information Commissioner’s Office (ICO) on 2 November 2009 for it to release all information requested by the Clean Air in London on 22 January 2009. On 3 June 2010 the European Commission sent the UK a final written warning for breaching air quality laws for dangerous airborne particles (PM10) in London every year since 2005. The Mayor of London has taken a succession of backward steps on air quality measures in the capital including: the postponement of Phase 3 of the low emission zone from 4 October 2010 to 3 January 2012; the removal of the western extension of the congestion charging zone on 4 January 2011; and the weakening of other measures in his Air Quality Strategy published on 14 December 2010. The European Commission is due to decide imminently (and by early February 2011 at the latest) whether or not to allow the UK a time extension until 2011 to comply with the PM10 daily limit value in London. The European Commission is likely to progress from its final written warning and refer the UK to the European Court of Justice over breaches of air quality laws for PM10 if it rejects the UK’s reapplication for a time extension on PM10. 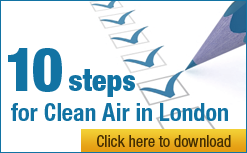 More information on Clean Air in London: http://cleanair.london/. Friends of the Earth believes the environment is for everyone. We want a healthy planet and a good quality of life for all those who live on it. We inspire people to act together for a thriving environment. More than 90 per cent of our income comes from individuals so we rely on donations to continue our vital work. For further information visit www.foe.co.uk.